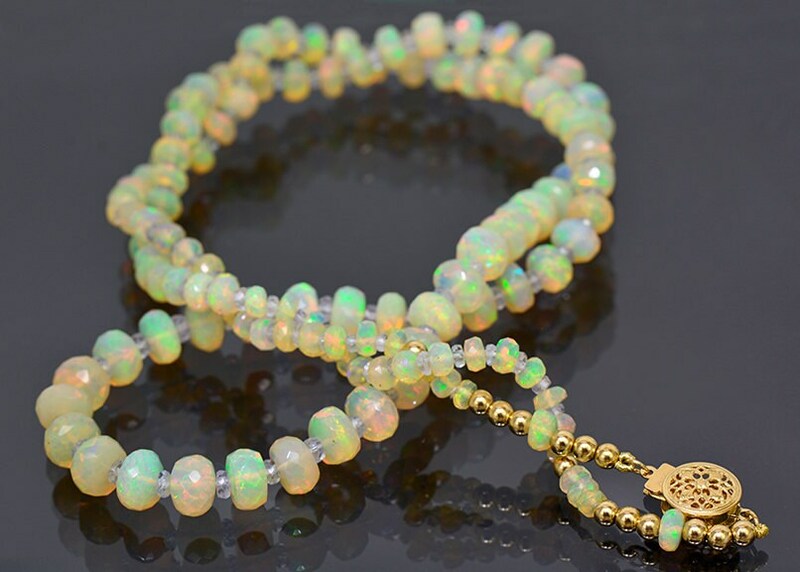 Fantastic Faceted Opal and Sapphire Bead Necklace with 14 kt Yellow Gold Clasp 78.0 tcw. 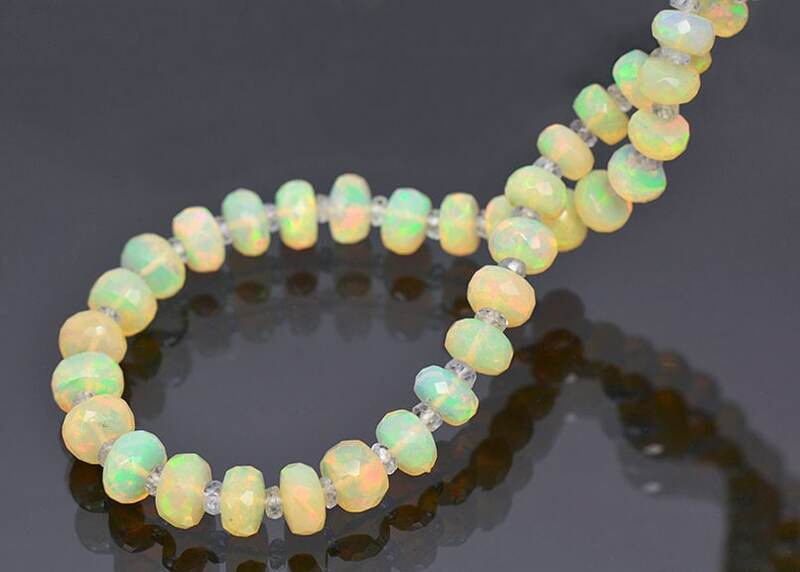 This is fantastic Opal and white Sapphire necklace! 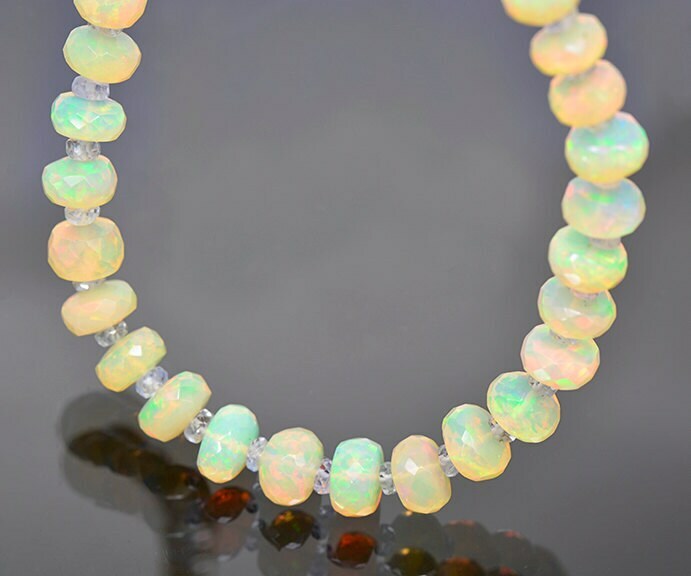 This stand features a graded set of multi-color flash, faceted Opal beads with alternating faceted white Sapphire beads. Each bead is hand cut and selected to match for this continuous stunning strand. The clasp is a filigree design safety in 14 kt Yellow Gold that adds such a nice regale touch to this piece. 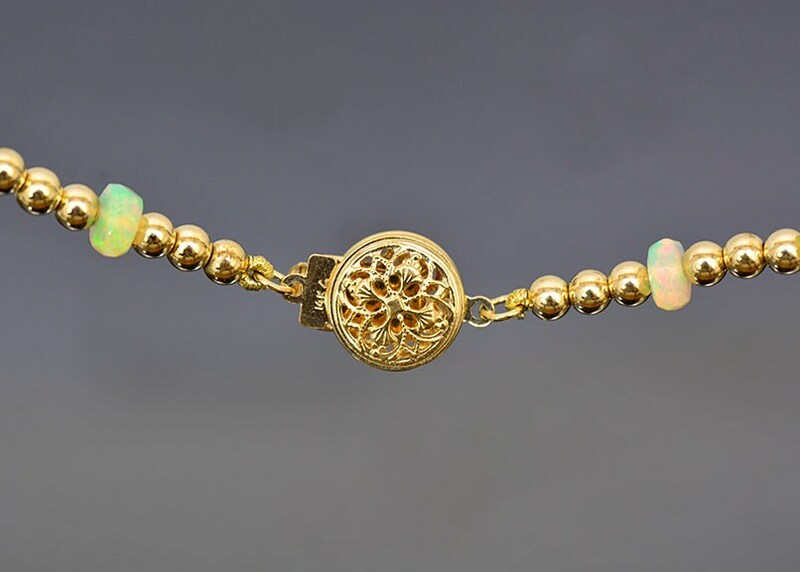 There are 12 14kt yellow gold beads strung in near the clasp that are beautifully placed, while making the necklace easier to take on and off because of the greater range of motion. The beads are strung with reinforced silk and each bead is individually knotted in the event of a break, where the most beads that will be lots is 1. The entire necklace is 24 inches long with the total weight of 62 carats of Opal and 16 carats of Sapphire! The beautiful facets roll and glitter when the piece is worn. As this stand rolls and moves in the light, the different colors transition and it looks like an electric rainbow pulsing through the entire strand. 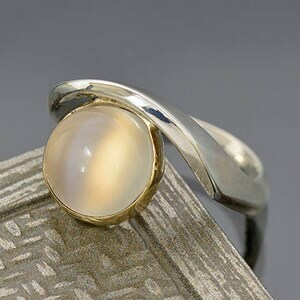 The opals adapt to whatever color is being worn, for instance. On blue fabric the blue flash in the Opal is more predominant while the slight orange body color of the Opal contrast beautifully! On black these look the best, and the just gleam from across the room! 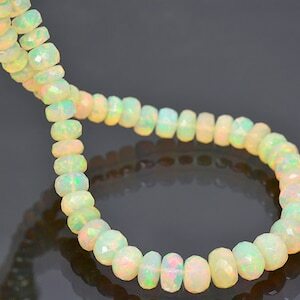 I can’t say enough about how stunning this strand is! Enjoy! Size: 7.44 to 3.48 mm. 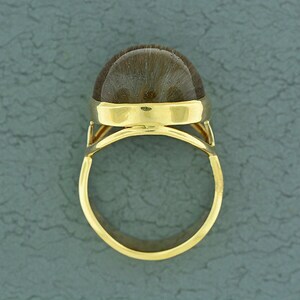 Graded Diameter. Color: White, Orange, Yellow, Blue, Green, Pink, Purple, Fuchsia and Red! 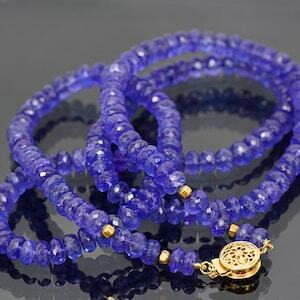 Breathtaking Faceted Tanzanite Bead Necklace with 14 kt Yellow Gold Clasp 196.0 cts. 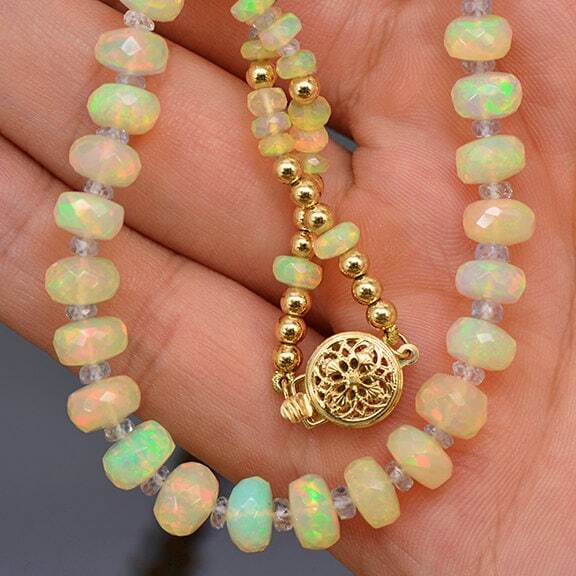 Stunning Faceted Opal Bead Necklace with 14 kt Yellow Gold Clasp 68.0 cts.